Scotland’s mission to finish their summer tour unbeaten failed as they lost 27-22 to Fiji in Suva. The Scots won the try count by three to two but their discipline was poor and they were ripped apart by the brilliant handling of Leone Nakarawa and five penalties from fly-half Ben Volavola. Scotland applied more of the early pressure but their handling in the steady drizzle let them down until home lock Tevita Cavubati was sent to the sin bin for pulling his counterpart Jonny Gray down in the line-out. A catalogue of errors from the Scots as they tried to run clear gave Fiji an attacking platform. Volavola, who won last week’s game against Italy with a late drop goal, had missed a long-range penalty but made no mistake with his second shot from straight in front. While Scotland were having problems with their handling, Fiji continued to struggle with their discipline, so when they also lost prop Peni Ravai for collapsing a maul, Scotland took full advantage. They set up a line-out maul and Ross Ford, on the day he broke the Scottish caps record by winning his 110th, claimed his third try of the summer tour. The Scots know all about former Glasgow player Nakarawa and should not have been surprised that he was running around producing outrageous offloads. The islanders ramped up the pressure, with Nakarawa flicking the ball clear from a maul on the Scots 22. Volavola’s cross kick was perfectly placed for Patrick Osborne to claim the ball on the wing and he found flanker Peceli Yato in support to take the scoring pass. Volavola could not land the conversion but it still meant Scotland were trailing at the break with plenty to do if they were to salvage the result and prolong their winning run. They were not helped by yet another turnover near the halfway line that allowed Fiji to zoom the ball across the field, where Osborne banged the ball downfield. Greig Tonks, on at the break for Duncan Taylor, made a mess of clearing up the loose ball, handing the home side a scrum. They had shots at scoring a try but eventually settled for a penalty, with Volavola doing the honours to give his side a seven-point lead. Scotland should have got back on level terms when Henry Pyrgos spotted a gap, but he missed his support runners with his pass, only for Fiji to mess up their attempt to clear the ball. It squirted out straight to Ruaridh Jackson, now up at fly half, who had an easy run-in for his first Test try. His conversion levelled the scores, for a few minutes at least, until Volavola put Fiji back in front with a penalty. Fijian joy was soon doubled when a piece of individual brilliance from Nakarawa saw him break through and offload to replacement scrum-half Henry Seniloli for a brilliant try that pushed the lead out to 10 points after Volavola’s conversion. 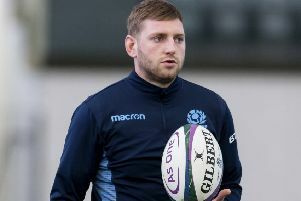 Scotland did fight back with Fraser Brown grounding at the back of a driving maul, but again their mistakes cost them as they handed the ball back to Fiji after the restart. Fiji: Murimurivalu, Tuisova, Vulivuli, Vatubua, Osborne, Volavola, Vularika, Ravai, Koto Vuli, Tawake, Cavubati, Nakarawa, Waqaniburotu, Yato, Qera. Replacements: Tuapati, Veitayaki, Ducivaki, Nabou, Dawai, Seniloli, Stewart, Masilevu. Scotland: Jackson, Hoyland, Grigg, Taylor, Visser, Horne, Pyrgos, Allan, Ford, Nel, Swinson, J. Gray, Barclay, Hardie, Strauss. Replacements: Brown, Reid, Fagerson, Toolis, Watson, Price, Tonks.